Twenty four down. Thirty one to go. 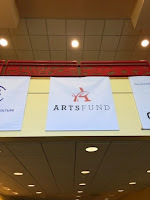 At ArtsFund's Celebration of the Arts luncheon last week an elegant woman wearing a beautiful broach told me that jeweled pins are selling like hotcakes in our area. She credited Bellevue Art Museum's Read My Pins exhibit, and I believe her. After being described as an "unparalleled serpent" by Saddam Hussein's press, Madeline Albright wore a golden snake broach on her next visit with Iraqi officials. That led to a long relationship between Albright's diplomatic point of view and her jewelry, to the point where she described her jewelry as part of her personal diplomatic arsenal. 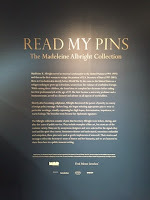 This unique show, which runs through June 7th, showcases over 200 pins which Albright famously used to make diplomatic statements, highlighting the ability of art to communicate in a nonverbal but powerfully articulate way. 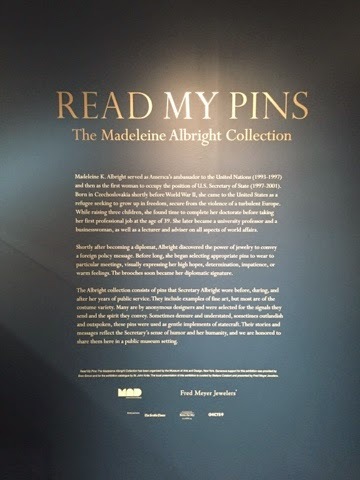 Through the beautiful jewelry and very well executed commentary about each piece, the exhibit tells the fascinating history of Madeline Albright's service as UN ambassador and then Secretary of State. 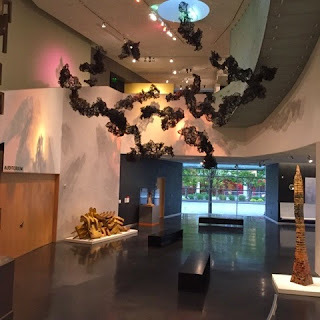 Bellevue Art Museum has been exclusively dedicated to art, craft and design since 2005. From objects made for everyday use to cutting-edge sculpture, furniture, and jewelry, BAM celebrates the creative process and skill of today's most talented makers. The museum features international exhibitions alongside some of the region's most promising artists. On my visit I also saw one of the exhibits featuring regional artists: The New Frontier - Young Designer Makers in the Pacific Northwest. 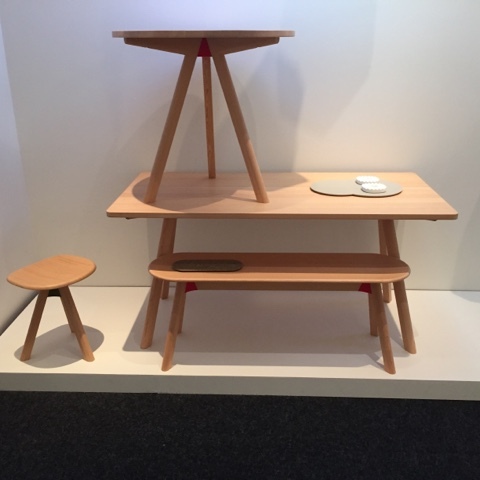 Organized by the museum, the exhibit is a tutorial on the beautiful works created by furniture artists and makers in our region. It runs through August 16th. BAM is one of few museums that grew out of an art fair. Started by a handful of dedicated volunteers, the first fair was held in 1947 and eventually led to the founding of the Museum in 1975. 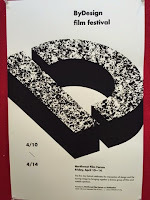 After undergoing a series of transformations, BAM opened the doors to its first permanent home in 2001 and continues to sponsor the Bellevue arts fair each year. See ARTSfair. And the elegant woman at the luncheon wearing the pin? It was honoree Ann Ramsay-Jenkins, recipient of the Lifetime Dedication to the Arts award. Thank you Ann for all you do to support the arts in our community. Twenty three down. Thirty two to go. In honor of our long anticipated trip to see Robin Hood at Seattle Children's Theater, my grandson, now almost five, dug into his costume box and joined us as Peter Pan (see Children Remind Us). That seemed a fitting choice. Like Robin, Peter is a swashbuckler who bends the rules while fighting the bad guys. So having Peter Pan attend Robin Hood made a certain amount of sense. 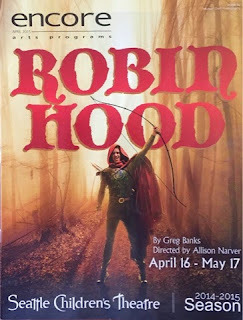 The central question posed by SCT's Robin Hood is, what is a hero? In Peter Pan, our hero takes the Darling children on a forbidden nocturnal adventure, but in the end he saves Wendy and the Lost Boys from the pirates, and everyone returns safe and sound. In Robin Hood the question is presented more starkly: Why do we think of Robin, an outlaw and a thief, as a hero? He steals from the rich to give to the poor, but he does so in defiance of the local sheriff. The sheriff serves a nasty and corrupt prince who has taken charge while the good King is off fighting foreign wars. Plenty of fodder there for SCT's robust after-show discussion with cast and audience about what makes a hero. Robin Hood worked well on many levels. The all-adult cast was strong and the staging excellent. There was plenty of humor, exciting swordplay, romance, and bad guys to hiss and boo. The show spoke to the adults as well as the kids, starting with the opening sequence where desperate Nottingham folks panhandled among the audience in an uncomfortably familiar manner. SCT has produced 235 plays since its founding in 1975, an incredible 110 of which have been world premiers. It started as a Seattle Parks and Rec Department program at the Poncho Theater in the Woodland Park Zoo. Some of its earliest supporters were teachers and students from the UW's Masters Program in Theater for Youth. 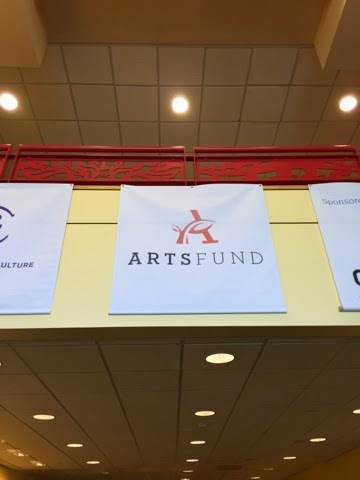 Today, all of the actors are Equity members and SCT is an independent non-profit, performing at two theaters in its beautiful Seattle Center home. The facility also has state-of-the-art paint, costume, prop and scene shops. When it was completed in 1995 it was the nation's only self-contained theater complex for young audiences. The grandson was a bit too young to join in the post-show discussion about what makes a hero. Children will listen, however, as he did with rapt attention. I am sure that in the weeks to come we'll be hearing a lot about who, in his fantasy-filled world, is a hero – and why. Twenty two down. Thirty three to go. 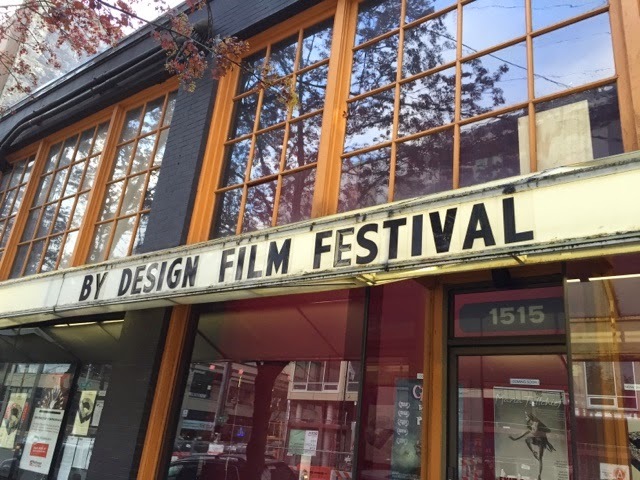 Northwest Film Forum's ByDesign film festival is an example of the wonderful variety of programs offered by ArtsFund-supported organizations. There is something for just about everyone. Interested in design and want to learn more? Then do what I did and invite an architect friend for a midweek outing to this long-running film festival that "brings together a diversity of people, ideas and creative visions to explore intersections of design and the moving image...." This year's films featured topics ranging from urban fashions to an exploration of how 3D printing will change the world, and included a panel discussion of Seattle's design renaissance. The truth is, before this project began I had no idea there was such a festival. 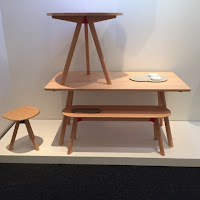 Now it's something I can look forward to as a way to connect with, and learn more about, art and design. The same could be said about several of the Northwest Film Forum offerings. Founded in 1995 by Jamie Hook and Debbie Girdwood, Northwest Film Forum screens over 200 independently made and classic films annually (several interesting films each week!) and offers a year-round schedule of filmmaking classes and programs that support filmmakers at all stages of their careers. Offering 60 workshops annually, NWFF has aided 250 filmmakers in the production of nearly 80 films. In addition, they offer innovative workshops and summer camps for children and teens. The Children's Film Festival presents awards for children's movies juried by kids 8 -15. In collaboration with Seattle Children's Hospital, the children's festival includes a satellite jury of young hospital patients who view their own slate of short films. The Sauerbruch Hutton film we saw followed a German architecture firm through a series of projects, some at the competitive proposal stage and others in design and construction. We saw the architects work and struggle as a team (in a very quiet, subtle and overtly polite manner) and struggle with their clients (who were somewhat less subtle and polite). The dynamics between the older principals and the bright young talent in the firm was fascinating to watch, and applicable to just about any work environment. The film provided fodder for an interesting conversation with my architect friend. He shared fascinating insights and humorous commentary on the interaction, some of which took him back to architecture school. Overall, it was a delightful evening and a fun opportunity to learn a bit more about the world of design through the diverse offerings of the Northwest Film Forum. the new 12th Avenue Arts theaters. Twenty one down. Thirty four to go. We have enjoyed the Seattle Men's Chorus for many years, and have seen several of their shows on the lighter side including holiday concerts and performances built around beloved entertainers like Debbie Reynolds. They were all great fun. But the concert we saw recently was more serious: Legacy was a powerful exploration of tragedy and triumph, an inspiring evening of beautiful music. It was clearly our favorite to date. Tyler's Suite is an eight-piece choral work dedicated to the memory of Tyler Clementi, who died by suicide after being cyberbullied by his college roommate. The work was brought together under the musical leadership of Stephen Schwartz (composer and lyricist of Wicked and Pippin). It featured a violinist and told Clementi's story through narration, photographs and video. Tyler was an engaging young man, brother, and son who loved the violin and riding a unicycle (often simultaneously). Tyler's mother and brother spoke at the concert about Tyler and the work of the Tyler Clementi foundation, dedicated to ending "online and offline bullying." 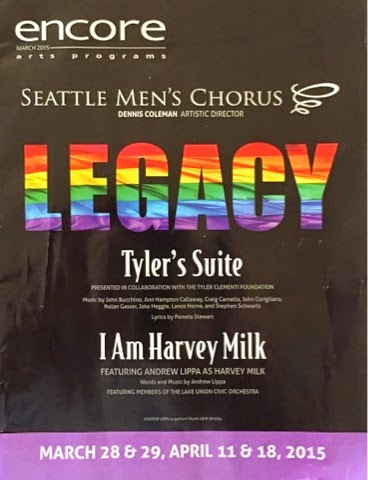 Broadway composer and lyricist Andrew Pippa wrote I Am Harvey Milk, a stirring tribute to the famous politician and civil rights leader. The work featured a superb soprano, Seattle native Rachel DeShon. Pippa appeared as Harvey Milk, a role he first performed at Lincoln Center alongside Kristin Chenoweth and a 120 member All-Star Broadway Chorus. Perhaps it is just my local bias, but it is difficult to imagine that the strong Seattle production was exceeded by its star-studded Gotham cousin. 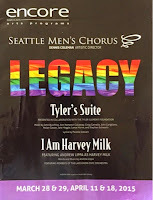 Seattle Men’s Chorus, founded in 1979, is is the largest gay men’s chorus in the world with over 350 singing members. Seattle Women’s Chorus, which made its premiere on stage in 2002, has over 300. Flying House Productions, the umbrella organization for both, is an arts non-profit which acts as a "voice for acceptance" in our region. It it also influential in the music world, having commissioned premieres from some of world's leading composers (including Gian Carlo Menotti), and collaborated with guest artists such as Mark Morris, Bobby McFerrin, Natalie Cole and Maya Angelou. It is interesting to read the History of the Chorus, not only as the impressive story of the organization, but also as a chronicle of the gay rights movement in our region over the past 35 years. We are looking forward to the Seattle Women's Chorus show in October, a return to lighter fare. Hallows in the Cathedral promises to enrapture the audience with a "dark and erie spectacle" in the shadow of the moon.